California’s climate change regulators are intensifying their efforts to reduce emissions of some particularly potent greenhouse gases – dubbed ‘short-lived climate pollutants’. The state’s new emissions targets could have potentially significant implications for dairy farms in the state, as well as the distribution of cap-and-trade funds to incentivize climate-friendly agricultural practices. These ‘short-lived climate pollutant’ emissions, which include methane, black carbon, and fluorinated gases, linger for a comparatively short period of time but cause a lot of damage in our atmosphere. For this reason, they are increasingly seen as a key target in the effort to slow the rate of climate change. 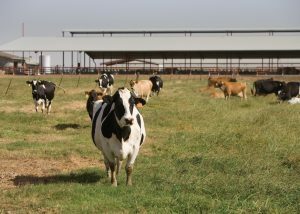 The California Air Resources Board (ARB) recently released a draft Short-Lived Climate Pollutant Reduction Strategy that, among other things, proposes to reduce methane emissions from dairy manure management by 75 percent in 2030. ARB has proposed to keep the dairy methane reductions voluntary unless there is insufficient progress towards the goal and the state determines that regulation is necessary. To spur that voluntary action, then, ARB will likely recommend significant public investment of cap-and-trade auction revenues for dairy-based strategies. It is crucial that state spending on dairy methane reductions produce the greatest possible benefit. This means promoting manure management strategies that provide additional air and water quality benefits; that offer flexibility and security for dairy operators in an already-volatile industry; and that are accessible to a wide variety of operations throughout the state, from confinement dairies in the Valley to pasture-based and organic systems on the North Coast. 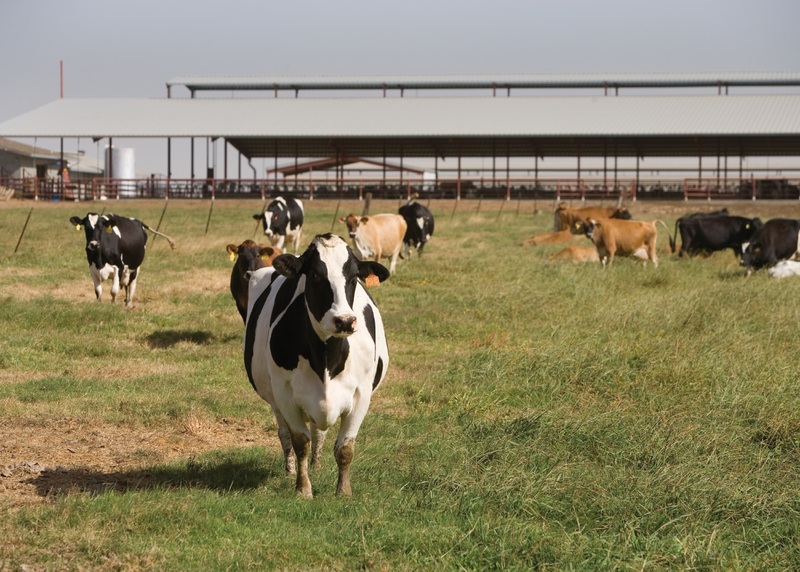 To that end, CalCAN recently submitted a policy memo to the Air Resources Board, Diversified Strategies for Reducing Methane Emissions from Dairy Operations. This report and the featured recommendations resulted from months of research, interviews, and analysis by the CalCAN policy team alongside Martha Noble (formerly of the National Sustainable Agriculture Coalition). In it, we recommend an approach that moves beyond an exclusive focus on anaerobic digesters to include dry manure management strategies as well as pasture-based dairying systems. Digesters are an expensive – and potentially unreliable – technological ‘fix’ that are not a feasible option for many California dairy operators. Where they can produce benefit, we suggest that the state do more to shift the financial risk of digester investment away from dairy operators, and at the same time promote co-digestion facilities that can make use of non-manure waste streams and provide flexibility. 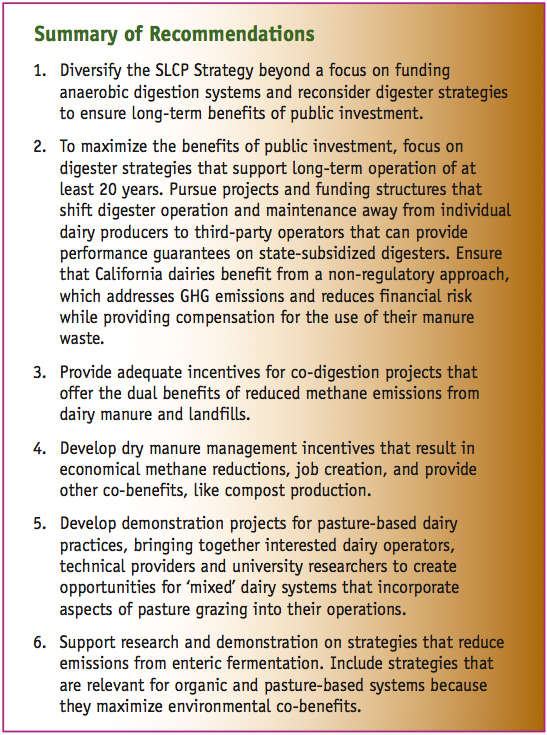 By diversifying the portfolio of manure management strategies available to dairy operators, we can ensure that the industry as a whole is encouraged to mobilize behind the state’s critical climate change goals. The Air Resources Board will officially adopt a final short-lived climate pollutant strategy in the coming months, which will guide decisions on how California funds are spent to achieve the targets. CalCAN has met with ARB staff to discuss our recommendations, and we hope the final strategy offers a diversified, accessible approach that reflects the diversity of the dairy industry. We encourage you to read through our analysis by clicking here.